Educators across Ireland (and the world) are engaging with technology more and more, whether it’s through the organisation they are working with or through the learners they are meeting and engaging with every day. The ubiquitous nature of technology and the expectation to be “creative” within each session can feel daunting at times. At Make Create Innovate, we work to align ourselves with your subject, module, or curricula, so that our hands-on sessions are relevant to your class groups whilst still being creative, inspiring and engaging. We also offer consultation to teachers in how to effectively coordinate a STEAM project in your school including tips on project planning, collaboration with other teachers, goal setting for students, presentation of outcomes, assessment techniques etc. Our goal is to work with you to enhance your practice and the experience for your students, giving you the confidence to be innovative in new approaches and encouraging you to be more individual within your sessions. 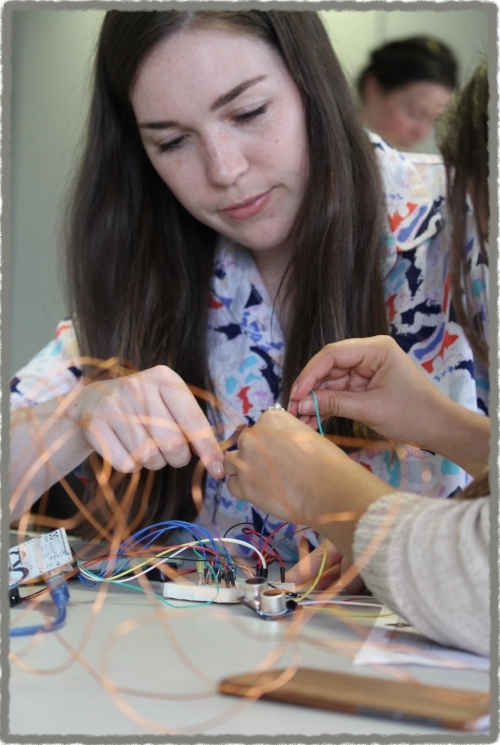 We offer workshops and courses that give learners the opportunity to make, build, create and explore. Each session is hands-on, working in teams to solve problems, using design and creativity to find new solutions. Activities include circuit making, programming with Sonic Pi and Arduino IDE, interactive design with MaKey MaKey, digital media production, basic robotics and more. We encourage all participants to take greater responsibility for their own learning, finding their own answers to questions that arise. We allow space for reflection about how we learn and how we interact with others.